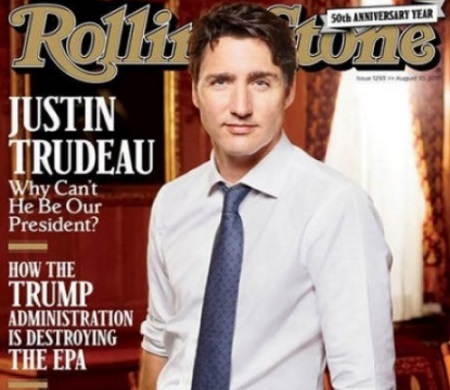 Prime Minister Justin Trudeau has made the cover of Rolling Stone magazine's August issue and heads are turning. The overall glowing story by writer Stephen Rodrick calls Trudeau “a progressive, rational, forward-thinking leader” who “overcame tragedy to become Canada’s prime minister”, such as the death of his younger brother Michel who was killed in an avalanche and the death of his father, former Prime Minister Pierre Trudeau. This leads up to Rodrick’s comparison of Trudeau and U.S. President Donald Trump’s stances on abortion, pot legalization, climate change, and Russia. “Trump's son met with Russian nationals who promised dirt on Hillary Clinton. Trudeau's foreign minister is Chrystia Freeland, a Canadian of Ukrainian descent who is banned in Putin's Russia,” writes Rodrick. Trudeau tells Rodrick that while he disagrees with Trump "on a whole bunch," the pair have "a constructive working relationship." There is some critique of Trudeau’s government towards the end of the article, such as “getting hammered by the right wing” for Omar Khadr $10.5 million settlement as well as broken campaign promises on electoral reform and the lack of improvement on the quality of life for Indigenous people. Some, not as excited about Trudeau’s cover, took to Twitter to say they’d happily offer him up to the U.S.
What are your thoughts? Let us know on our Facebook Page. Click here to read the Toronto Star article.